Unlike some bakers and cooks who love the food-centric day, Thanksgiving is not my favorite holiday. I enjoy spending time with family and relaxing in the midst of a busy season, but while everyone ooos and ahhs over the classic Thanksgiving meal, it just doesn’t do anything for me. I try my best to live in the moment, respect Thanksgiving (until last year I never listened to Christmas music until after Thanksgiving, no matter what!) and enjoy the quality time with family. I understand and absolutely believe in the importance of giving thanks and expressing gratitude, but I’m also so excited to get to my favorite holiday, Christmas, so I’m all for doing anything to make Turkey Day more exciting in any way I can. One way I do this is by making pies (thesethreeare some of my favorites). 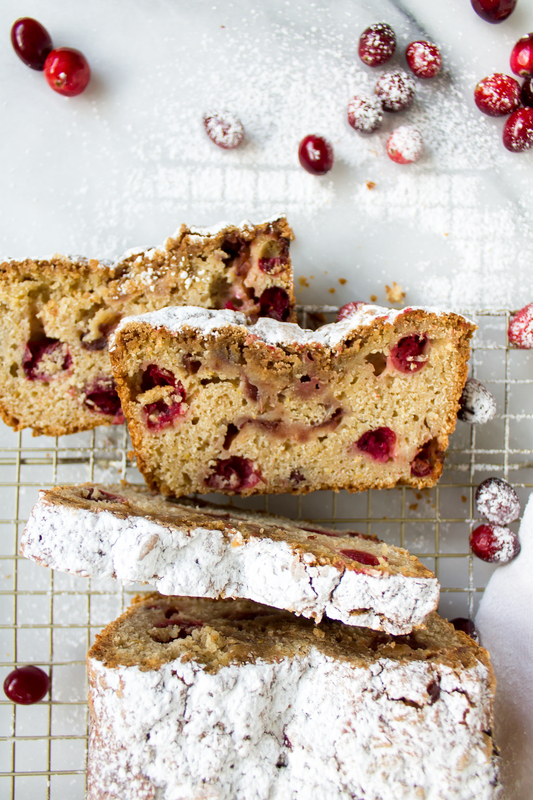 Another way, is by contributing this cranberry quick bread. 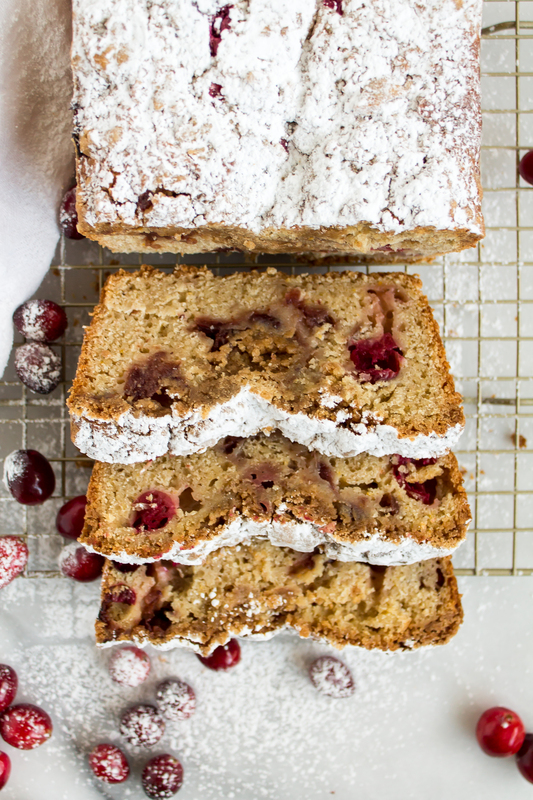 Cranberry quick bread is the perfect double duty bread. You can make it as a Thanksgiving Day breakfast and snack on it as you are putting together the rest of the big meal, or wait until after Thanksgiving and make it the next morning with your leftover cranberry sauce. Genius! 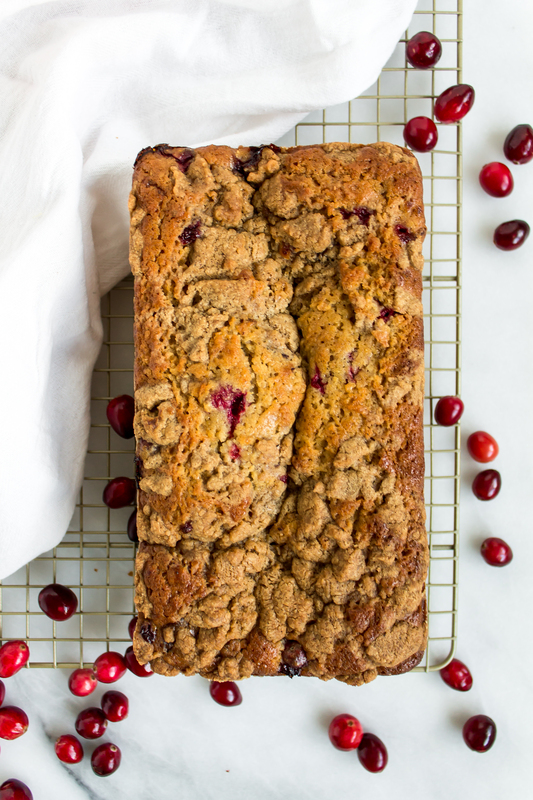 With tart cranberries, swirled sweet cranberry sauce and brown sugar crumble, the bread has a great combination of sweet and tart. The flavor profile of tart cranberries and subtle orange reminds me of my dad and my grandmother, who both enjoy a good homemade cranberry relish and a classic holiday punch filled with cranberry juice, amongst others. 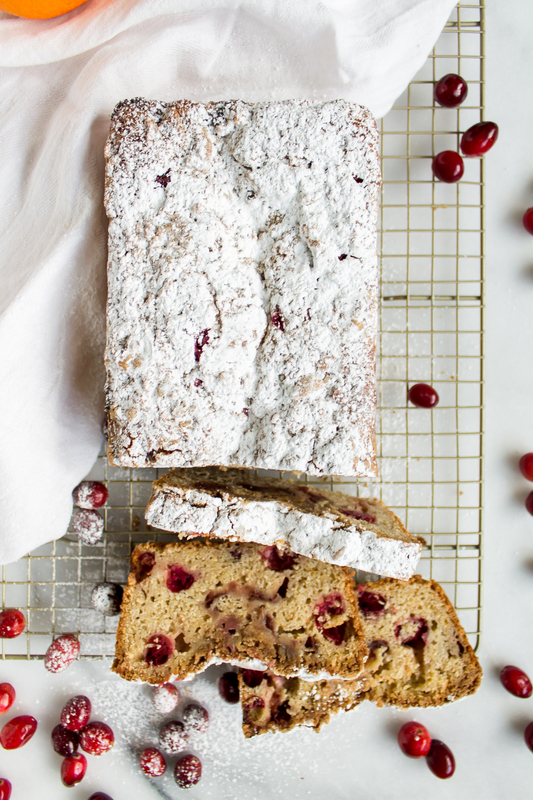 My grandmother often serves cranberry orange bread when we visit her, and the distinct orange smell of this bread coming out of the oven immediately brought those memories to my mind. *The amount of fresh or frozen cranberries you use should be based on how much you like the tart berry. 1 cup will make your bread more tart, while ½ cup will mean you have fewer cranberries throughout the bread, making for a less tart slice. 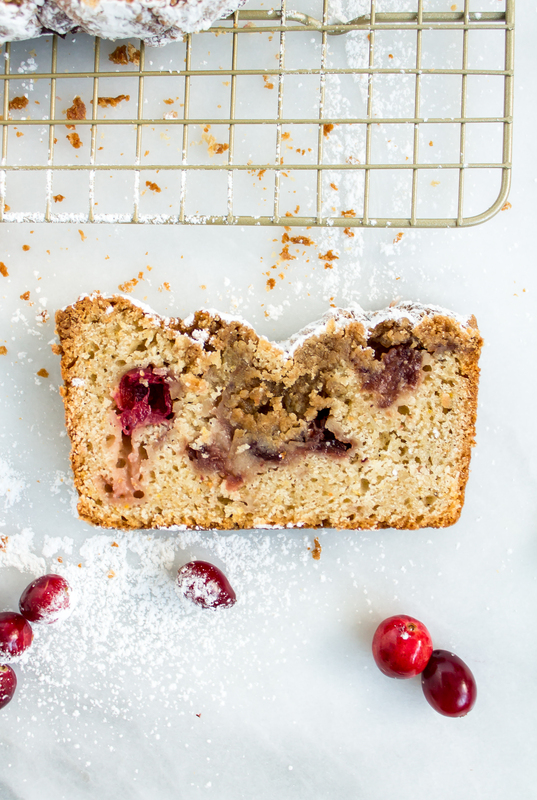 If you like it more sweet than tart, use ½ cup of fresh or frozen cranberries, and add an extra ½ cup of sweetened cranberry sauce instead. Really not into the tart whole cranberries? 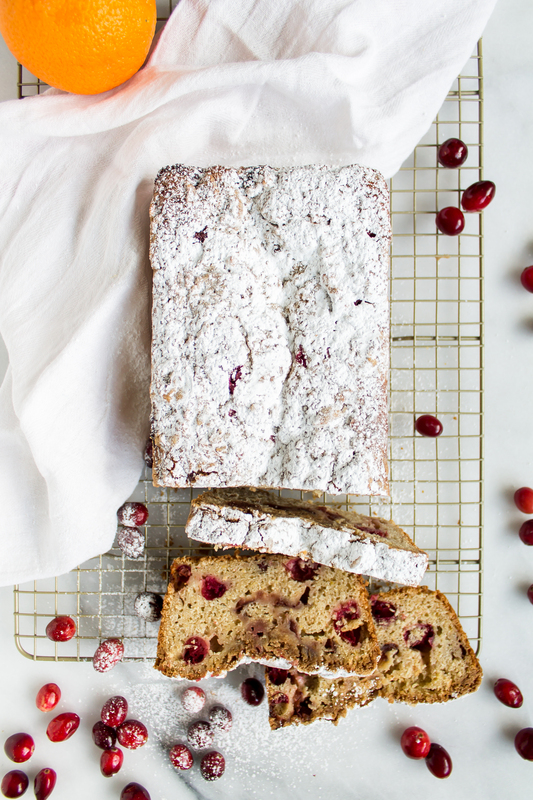 Replace them with dried craisins for a sweeter version of this bread. Preheat the oven to 350 degrees F. Coat a loaf pan in non-stick cooking spray and flour and set aside. In a large bowl, stir together the flour, baking powder, cinnamon, cardamom, nutmeg, and salt. In another bowl, whisk together the butter, sugar, eggs, buttermilk, vanilla, and orange zest and juice. Add the egg mixture into the flour mixture and stir just until the dry ingredients are all incorporated. Do not overmix. Gently fold in the cranberries so they are distributed throughout the batter. Pour half of the batter into your prepared loaf pan. Place dollops of cranberry sauce on top of the batter and swirl it around to mix it into the top layer of batter. Add the rest of the batter and repeat the cranberry sauce swirls on the top of the bread. Sprinkle the crumble evenly all over the top of the batter. Try to make sure no batter can be seen between the crumble. Bake for 1 hour – 1 hour 15 minutes, or until the center of the bread looks done and a toothpick or skewer entered in the middle of the bread comes out clean. If the edges of the top start to get dark and the center is still not done, cover the edges with aluminum foil before placing the bread back in the oven. When the bread is done, let it cool in the loaf pan for 10-20 minutes before transferring it to a wire cooling rack to cool completely. 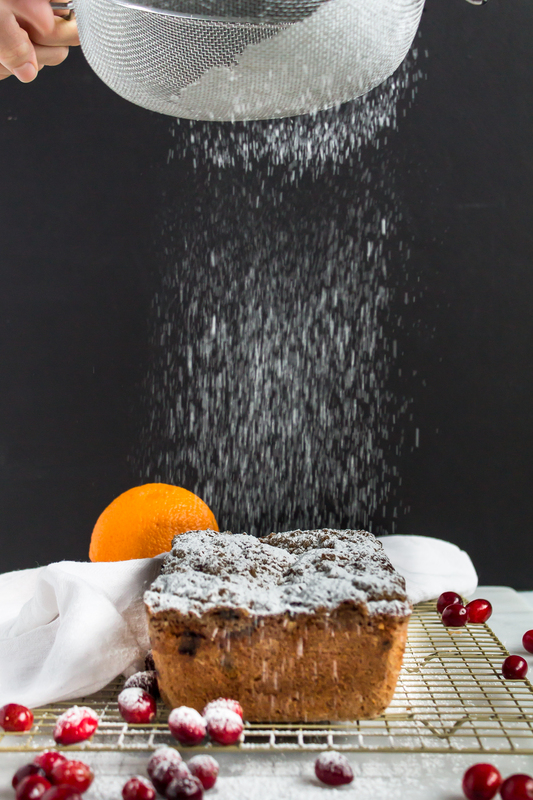 Once it is completely cool, sift powdered sugar onto the top of the bread and serve! This bread will keep in an airtight container or wrapped in aluminum foil for a few days but will start to get dry after that. If it starts to get dry, heat up a slice in the toaster oven or microwave and top with butter for a delicious way to bring some moisture back.